Malakoff is a hybrid sativa dominant strain, suitable for humid climates but not suitable for beginners. Very powerful cerebral efect stimulating the creativity. 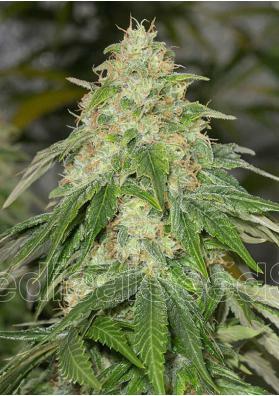 Malakoff is ahybrid feminized sativa dominant Marijuana strain, a crossing between Strawberry Haze and White Widow. Its has a great cerebral effect with energizing and creative touches. Malakoff transmits acid flavor blends with light strawberry-cream undertones. Its high level of THC makes it ideal as a medicinal strain to treat diseases like glaucoma. 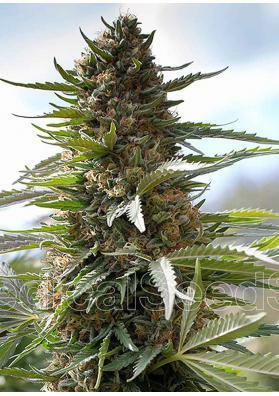 Malakoff is a marijuana strain recommended for experienced growers, its highly resistant to fungi, and therefore it can be grown on outdoors in places with high ambient humidity. In a growing room you will need to give it a growth period of 1-2 weeks to move to a bloom period of 70-80 days before giving prodcutions of 400 grams per square meter in good growing conditions. In the outside, it can reach 3 meters high and should be collected in mid-October, obtaining average productions.